This spare body parts set replicates a modern F-1 car. The design cues are inspired from those seen in the 2017 F-1 season. •	The body and driver parts come molded in lightweight and durable polycarbonate. •	The body design is inspired by 2017 trends, with a sharp, slanting nose and bulging side pontoons. 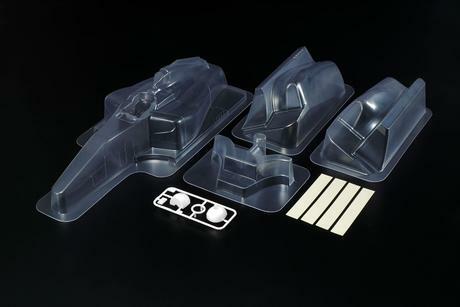 •	Additional polycarbonate parts are included to create alternative lower side pontoon sections as separate components, for chassis with larger R/C equipment. •	Compatible with F104 Pro Version 2, TRF 101-102 with minor modifications. •	Tamiya PS polycarbonate paint needed to paint the body.